Male Martha: Abbaye de Tamie Cheese: More Monks Gone Wild! Abbaye de Tamie Cheese: More Monks Gone Wild! And I thought that only monks in Belgium made cheese! Well, yet again I was proved wrong, this time by our friends from London. When they came to stay on Fire Island for a week, they were kind enough to make a pit-stop at Murray's and buy us some excellent cheese. One of these cheeses was Abbaye de Tamie, made by French Monks of that same named Abbey. The cheese has a thick, edible rind. It is a aged, raw milk cow's cheese. The monks suggest eating it from 21 to 45 days after it is finally packed. The cheese is soft and has an earthy flavor. 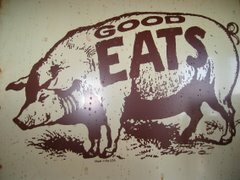 It was quite tasty, but I am not sure it is worth the $27 a pound they are charging for it on the internet. I hope it is less in the store. The Chimay cheese which I got at Zabar's has a similar taste and cost less. Its not quite as attractive, rindwise, but its close. 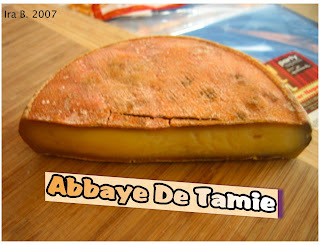 But if you want something a bit more exotic in your selction of religious cheese, go for the Abbaye De Tamie.